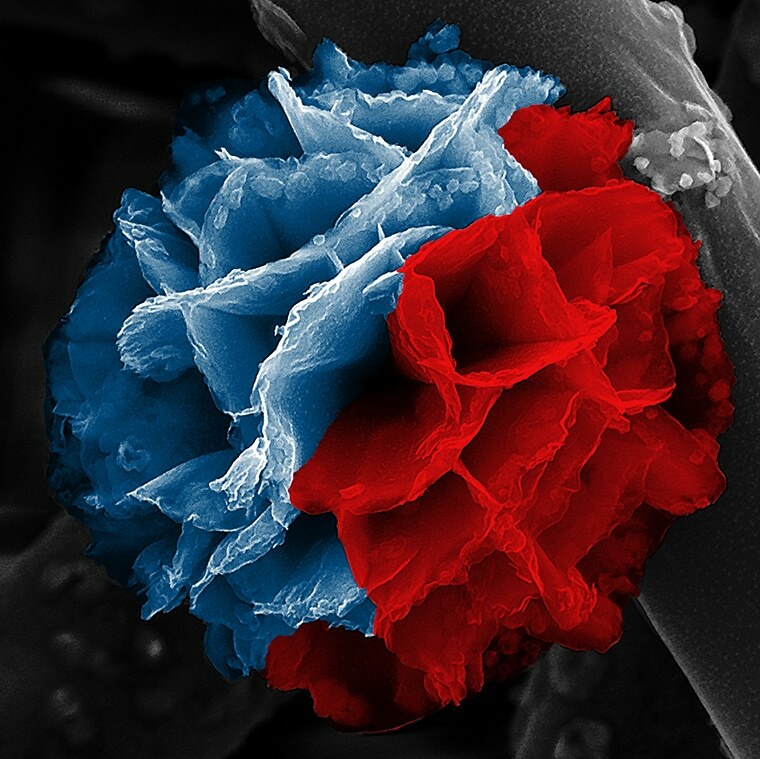 Although known as a nanoflower, upon brushing one’s cheek against the microscopic petals of conducting polymers, it is felt to be hard, cool, and rusty. The inner skeleton of these intricate and appealing nanostructures is formed of common rust. Their outer layer is formed of a type of plastic. Scientists at the Washington University in St. Louis have devised a simple method for producing this king of conducting polymer with a high surface area that could be probably used for energy transfer and storage applications. The new study is the cover story of the March 23, 2018, issue of the ACS Applied Nano Materials journal. Rust will always pose a challenge in Earth’s humid and oxygenated atmosphere. Corrosion makes structures fragile and decreases the ability of components to function properly. But in our lab, we’ve learned how to control the growth of rust so that it can serve an important purpose. Conducting polymers are produced based on a combination of inorganic and organic materials—in general, a plastic shell and a metal core—manufactured in a single batch. D’Arcy and his colleagues have described an innovative method that integrates solution-based hydrolysis with vapor-phase synthesis to develop one-dimensional nanofibers, two-dimensional nanoplates, and three-dimensional nanoflowers. This study provides in-depth knowledge of the chemical mechanisms behind the deposition of rust and the formation of the polymer, thereby enabling researchers to more readily control and engineer the structures of the materials produced by them. As chemists, my students and I are fascinated by conducting polymers because we can control their structure during synthesis. How much electricity the polymers conduct is a function of their chemical pathway and their number of charge carriers, both of which can be optimized during synthesis. In relation to the nanoflowers, D’Arcy stated that he will be initiating the formation of new varieties soon. A total of 16 stable phases of rust exist, where each phase has a different morphology at the nanoscale—adequate to build a garden full of rust.